what sort of wall you are hanging it on. This post considers how to hang a heavy picture, why use heavy duty picture hangers and how to attach them to a frame. It's the second post in a series of posts about how to hang a picture using different types of hanging hardware. The next post in this series is about How to hang a picture - using mirror plates. What is a heavy picture? a very heavy picture is one which you wouldn't think twice about trying to hang without an extra pair of hands. The issue is NOT whether you can lift it. It's about whether you have the strength and motor control in your upper body to execute a manoeuvre to hook it onto the wall on two sides - while holding it above your head. if you would struggle to hang a picture on your own because of size or weight then you ought to be thinking seriously about heavy duty hanging hardware - and checking the wall! What's the issue with walls? This is the question frequently not asked by people whose large and/or heavy paintings fall off the wall. Interior walls are built using a wooden framework and some form of covering - often plasterboard in modern houses. They're not really suitable for hanging anything heavy. Light and medium sized pictures can be hung on dry partition walls using picture hooks which are hammered into the walls using long hardened or steel pins. However steel pins are not long enough nor are they strong enough to hold heavy weight pictures and should NOT be used - unless you want your picture to fall off the wall. Ideally you should aim to hang medium sized pictures where the stud frame is (i.e. into wood which provides a more stable structure) but the chances are the location of the wall stud does not fit where you'd like to hang your picture. To check their location you need to use a stud locator. 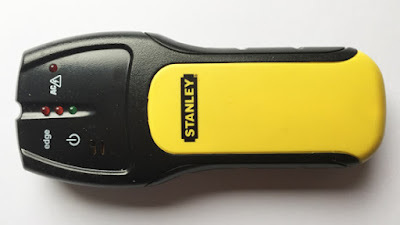 My studfinder - invaluable for older properties and where you have drywalls. If you know the drywall is robust you can use a special anchor for dry walls. All the artwork I possess - except for the smaller lighter works - are hung on brick walls - see below. Domestic homes will always have exterior walls and load-bearing walls which are suitable for hanging items which are a heavy weight. Typically in the UK the wall is a solid masonry (brick or stone) wall or a concrete block wall. These are the walls from which to hang a very large or very heavy picture (or mirror i.e. there's a good reason why very large mirror are very often found on chimney breasts). That's because this type of wall can take the longer screw length which might be required to get a solid fix. If you're hanging artwork in another sort of space you need to check what sort of wall it is. Banging on the wall often provides a good indication. If it sounds hollow then it's an interior dry wall. The other trick is to bang in a nail. If it's easy to hammer in then chances are it's a drywall. If it takes a lot more effort it's probably a masonry wall. If it's really difficult to impossible then it's very likely you've hit concrete and only drills and screws (and a heavy duty electric drill) will work. The same can be said for good quality exterior brickwork. One further consideration is the decoration. If you think you might want to move paintings around a lot I wouldn't favour walls which are wall papered! It's easy to fix holes in a painted plaster wall - but sorting out multiple large holes in nice wallpaper is a bit of a challenge! What is heavy duty hanging hardware? Heavy duty hanging designed to provide a more secure fixing to large and/or heavy pictures. They're made of more robust metal and commonly have at least two if not three screw holes. the heavy duty J hook - this is fixed to the wall and is the mate for the heavy duty hanger fixed to the frame. It provides the secure structure over which the D ring or loop is hung. Why use heavy duty hangers? Hanging is basically as good as the weakest point within the apparatus and the level of tension placed on any weaknesses. Hence in general it's advisable not to use wire and d rings for very heavy pictures because it's been known for the wire to create a lot of strain that in turns pulls a one screw D ring out of the back of the frame - and the picture comes crashing down. the length is dictated by the nature of the wall and length of screw used. a spirit level - ideally one which is long! Aim: The D ring /loop goes straight over TWO static and robust hooks on the wall - no picture wire or chain involved. Fix hanging straps to either side of the frame. Fix hanging hooks to the wall. Hang the strap over the frame. Locate the studs in an interior wall if not using a sold wall. Check whether the width between the studs is compatible with the width between the vertical uprights of your frame. If not review whether you want to relocate the place to hang. Mark off the same distance from the top of the frame. Make sure that you've taken account of the size of the hook it will be hanging over which is going to fixed to the wall. (You need to avoid this being on show) Try placing the hook on the back of the frame, then place the hanging loop over it and determine where the plate needs to go on the back of the frame so that the hook is invisible. Drill a hole and screw the hanger in near the top on either side. Make sure that the the plate is vertical and that the D ring or loop is positioned at the top of the plate (ready to loop over the hook). Use the tape and spirit level to get the level right (i.e. bubble in the middle). Mark up the wall where the hook needs to go and then drill (and rawlplug) the hole and screw the hook to the wall. Watch this video (below) if you don't have a long spirit level for how to mark up the wall and judge the distance between the two loops and hence get the hook in the right place on the wall (Note the artwork in the video is large but not too heavy or one person to hang and already has D rings attached.) Heavier artwork needs two people to hang it. She is also hanging on to nails - which is NOT advisable with heavy artwork - but the value of this video is the method used for how to get the measurement right without a long spirit level (as seen in the video above). Below are more videos which demonstrate different techniques used for heavier pictures. The first video demonstrates how to use locators in conjunction with D Rings. This is more suitable for medium sized work. This next video shows you how to hang a picture using a horizontal interlocking bracket system - which makes it much easier to get the picture on or off the wall. The principle is the same but just using a different type of kit to do provide the hook and hanger. Ook Picture Hangers - includes hangers for heavy weight hanging on a variety of surfaces. This video explains how the Ook hanger works. She's using it on a drywall because of how easy it is to knock in. The bit she misses out can be found on the website i.e. these are hooks for use on drywall and plaster wall surfaces. The Weight ratings are based on hangers nailed into studs and are for comparative purposes only. Choose a weight rating that greatly exceeds the object to be hung. This post 5 Favorite Picture Hanging Tricks has one of my favourite tips - use a post-it note to capture the debris when drilling! The POLL: Exhibition frames: How much do you spend per frame on average?- and the responses and overview of the results How much do you spend on exhibition frames on average? 30 Apr 2011 - The reason I've chosen exhibition frames is because when we are framing for ourselves we can either put up with something very cheap or spend a lot of money.